Chris Hession has been a product and marketing manager for nearly 15 years. But recently, his job completely changed. “Just in the last year and a half, social media has become not just a component of our product marketing plan, but really the core component,” said Hession, currently senior manager of Autodesk’s AutoCAD product marketing. 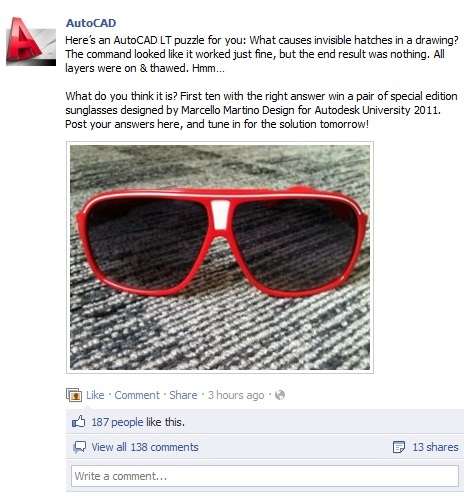 Millions of people worldwide use AutoCAD software to design everything from sunglasses to skyscrapers. 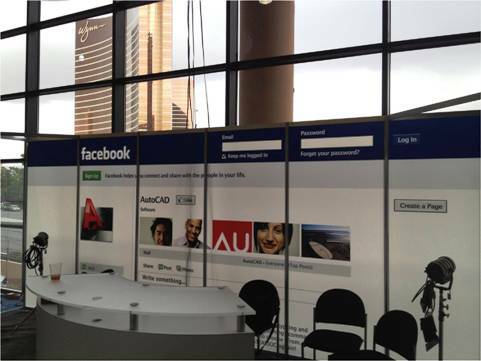 If there’s any question that a B2B software company can market effectively with Facebook, look no further than the AutoCAD team. The firm Nikken Sekkei used AutoCAD to design the Tokyo Sky Tree. 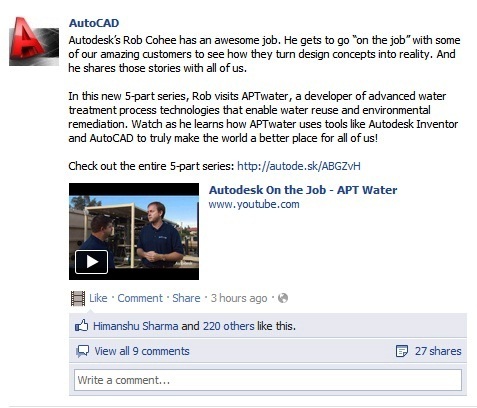 The AutoCAD Facebook page has become a new media channel of sorts, with largely live and on-demand video keeping fans very actively engaged. Every day the AutoCAD group connects directly with its audience on Facebook, bringing them high-value educational video, tech tips, fun quizzes and reality TV–style segments. At the start of 2011, the company had 120,000 fans. Now it has reached 652,000. “In Internet time, that’s an eternity,” Hession said. Here’s how the AutoCAD team attracts and keeps fans with interactive, two-way content. The average viewer spends more than 20 minutes watching AutoCAD Facecasts. The company brought 250 sessions from its Autodesk University—about one-third of all presentations—straight from the event to its Facebook fans. About 850 people watched a live product announcement on Facebook with another 2,200 catching the recording, just on the first day. 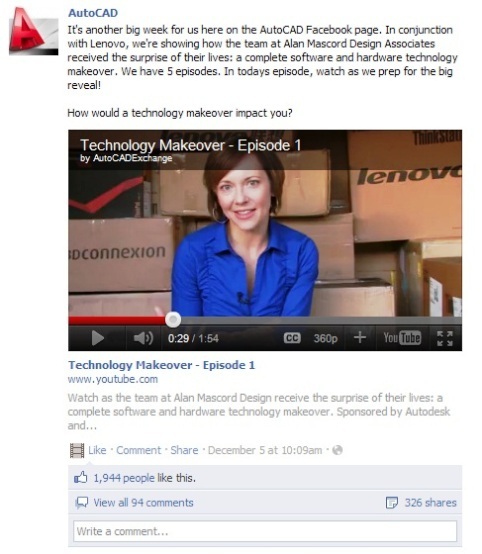 The first episode of “Technology Makeover” drew 1,944 Likes, 94 comments and 326 shares. For those who design physical structures and objects, AutoCAD is an undisputed leader worldwide. Chances are something you touched today—from your car to the road you drove on—was designed using their software. Though not every B2B organization is a fit for Facebook, two traits of the software’s target audience make Facebook just the right marketing medium for AutoCAD. 18- to 24-year-olds, in design school or in their first jobs, are overwhelmingly on Facebook. Facebook provides a place to connect directly with this young audience across the globe. AutoCAD is used by designers in hundreds of countries. 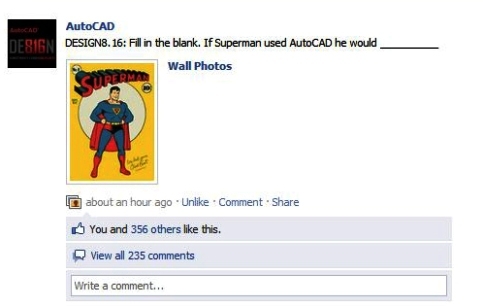 Two years ago, the AutoCAD team created a fan page and started populating it with informative and entertaining content designed to encourage two-way interaction. Fans answered a recent tech quiz for the chance to win sunglasses. The company started what they call Facecasts, live presentations on Facebook by AutoCAD product specialists on different aspects of the software. Using the Livestream plugin, product specialists spend about 15 minutes on a different topic each time and take questions afterward. Unlike YouTube posting, Facecasts enable valuable back-and-forth with the audience. Facecasts, streamed live with Livestream, draw big attendance. Since last spring, the AutoCAD team has run 15-20 Facecasts, drawing around 25,000 viewers so far to the live and then recorded sessions. In their book, that’s hugely successful. Every year, about 8,000 designers from around the world descend on Las Vegas for the annual user group conference, called Autodesk University. But not all of the company’s global audience can make it to Vegas. This year, the company brought 250 sessions—about one-third of all presentations—straight from the event to its Facebook fans. Autodesk used a custom-built app to allow customers to access the sessions on its fan page, while eight sessions were broadcast live. “Our goal was to bring the energy, excitement and inspirational aspects of Autodesk University to our Facebook friends,” Hession said. Autodesk also set up a broadcast booth in the middle of the show floor with a backdrop that made guests feel as if they were stepping into Facebook. Over the three days, broadcasts featured customer stories and insight from Autodesk executives. The broadcast booth at Autodesk University brought video via Facebook to the company's thousands of fans unable to attend the live event. 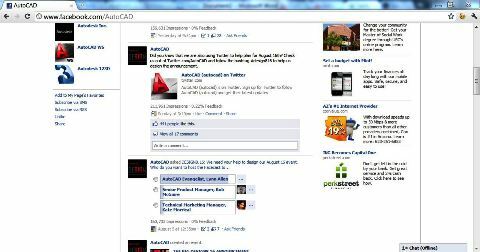 With Facebook firmly planted as a major marketing staple, the AutoCAD team took a big step this past summer. 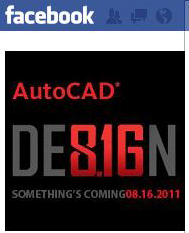 The group officially launched its new AutoCAD for Mac software right on its Facebook page. But ahead of the launch, the company spent half a year building the fan base through engaging broadcasts and other content, and with very targeted Facebook advertising. By launch time, the AutoCAD group had added a few hundred thousand new fans, many from developing markets like the Philippines and India. Also prior to the launch, the AutoCAD team engaged fans to help crowdsource details of the launch, asking them to co-design the launch announcement and to help decide the when, who and how of the event. Fans voted on the AutoCAD person they wanted to host the Mac launch. An event-specific AutoCAD profile image brought awareness of the launch. On August 16, the actual announcement was broadcast live on Facebook with a Q and A session following. About 850 people attended the live announcement with another 2,200 catching the recording, just on the first day. Hession, far right, and the production team direct the Mac launch. The format also allowed customers (for the first time in a launch event) to interact directly with the launch team through Facebook comments. 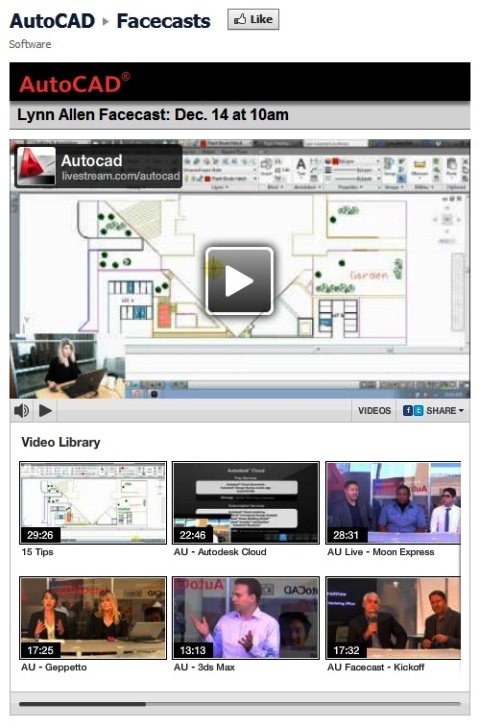 In the past, Autodesk launches were via traditional webinar. Beyond fan engagement, the software gained widespread exposure from 76 blog posts, with nearly all of those bloggers watching the Livestream. Fun questions caught fans' attention and brought in 235 comments. Facebook continues inspiring creative video content. In December, Autodesk and Lenovo aired the first “Technology Makeover,” a series of five short episodes where the firm Alan Mascord Design Associates received a full tech makeover. The segments took an HGTV-style approach with a show host, “prize van” and surprise visit to the design firm. Each episode runs 2 to 5 minutes, and is also available on the AutoCAD YouTube page. Facebook fans loved the series, with the first episode drawing 1,944 likes, 94 comments and 326 shares. The first episode of the Technology Makeovers was a success. With the success of the first makeover series, Autodesk plans to roll out a Facebook contest to find the next candidate, using a voting app from Votigo. Facebook broadcast segments are the anchor content for the software’s fans, but the AutoCAD team peppers in regular text-based tips, quizzes and polls that keep customers involved. The key: be interesting, relevant and regular with content. Well-crafted customer stories educate and entertain. While the AutoCAD team does count engagement levels in the form of Likes, comments, shares, views and questions, Hession and the company mainly see their efforts as critical brand-building that’s tough to truly measure. For them, talking directly to customers is gold. “For me, it’s ‘How can we have a direct communication with our customers? '” Hession said. 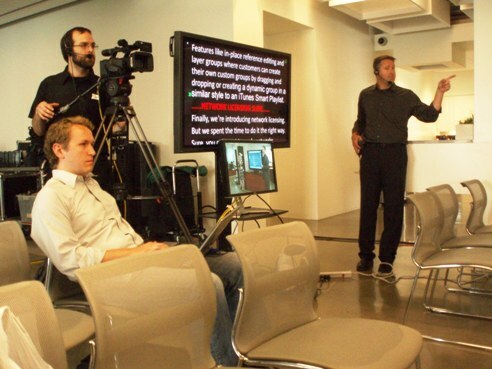 Ditch the script—Software product managers have become the “talent” for Livestream broadcasts. Keep it real by letting experts talk about what they know, without a script. Keep video times relatively short—AutoCAD video presentations are no more than 20-25 minutes, and then experts answer fan questions. Encourage questions repeatedly—Fans might be shy, especially those with foreign native languages. Push for questions, encouraging your fan base. Have fun—You may be B2B, but there’s no reason to be stodgy. Fun content gets a reaction. What do you think? How has Facebook “broadcasting” affected your marketing? 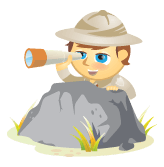 Do you plan to do more in 2012? Leave your questions and comments in the box below.